Headlies: JOEY STYLES CELEBRATES THREE “REBELLIOUSLY EXTREME” YEARS RUNNING WWE.COM / JACK SWAGGER TAKES OUT OVERSIZED NOVELTY TEETH, PUNISHED FOR REVEALING NORMAL SMILE / COLT CABANA PROVES THAT JUST ABOUT ANYBODY CAN BE NWA CHAMPION - WrestleCrap - The Very Worst of Pro Wrestling! Stamford, CT – Since leaving the ECW broadcast booth in the spring of 2008, Joey Styles has diligently and tirelessly put much time into running WWE.com, the most viewed wrestling-related website on the internet. Known for his pull-no-punches broadcast style, as well as his vicious swipes at rival wrestling companies, Styles has brought that firebrand attitude to his current role in web development and oversight. The Fred Savage-looking rebel made it clear that WWE.com is his house, and that he’s not going to yield an inch to corporate overlords. Styles left his post as ECW announcer with some controversy, as his vacancy gave way for inexperienced wrestling personality Mike Adamle to take over as the voice of ECW. Some believe that this was a “demotion” for Styles, to show him that WWE was willing to replace an outspoken avatar with a more “suitably corporate” one. Styles was also asked if he ever anticipated a return to the broadcast booth some day. Perry, Oklahoma – Getting noticed is a must in pro wrestling, and Jake Hager, known to wrestling fans worldwide as Jack Swagger, knew it. In order to get noticed, Swagger decided to go back to his childhood passion: novelty (also known as “gag”) toys. Swagger made his debut in Deep South Wrestling under his real name to little fanfare. Frustrated, he went home in search of an answer to his struggles. He found that answer tucked away in a shoebox under his bed: oversized false front teeth. Swagger knew this would give him a distinctive look no one would forget. 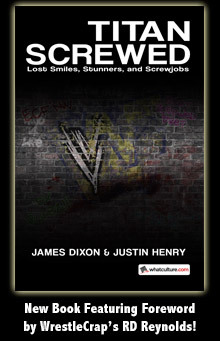 His new oversized, ultra-white dentures in place, Swagger became a favorite of Stephanie McMahon, head of WWE Creative. Swagger shot up the card first in ECW and then on Smackdown, eventually winning the World Heavyweight Championship. It seemed there was no mountain he couldn’t climb, and was poised to become a tippy top guy in the company. But then one day, things went wrong. Swagger concluded that had the mascot been a giant rubber chicken instead, the company may have been onto something. Hollywood, CA – With his win over Adam Pearce on March 6, 2011, Colt Cabana is now the NWA World Heavyweight Champion, conclusively proving that just about anybody can hold the title. Cabana joins the ranks of Brent Albright, Mike Rapada, and AJ Styles, as wrestlers who weren’t good enough to escape “B-Show Hell” in WWE, yet can claim a World Championship on their resume. Cabana’s average technical wrestling skills, as well as his business-exposing posturing and humor that he delves into during matches, have made him a hero to wrestling fans with no grasp of true psychology, let alone a grasp on their own personal lives. Cabana was also asked about his first defense. The RD and Blade Show: Episode 21!